My Orange Syrup Cake served with Cardamom Cream is moist, crumbly and super moreish. The addition of sour cream to the cake batter, along with the syrup pour makes for a wonderfully soft and creamy centre that will keep you coming back for seconds and thirds. Made with a scrumptious Orange, Barley and Passionfruit Syrup from NZ’s Barker’s of Geraldine, it couldn’t be easier to whip up in your kitchen mixer and with a never-fail recipe it’s perfect for even the most inexperienced of cake bakers. Preheat a fan-forced oven to 180C and grease and line a 22cm round cake tin with non-stick baking paper. Using an electric beater or kitchen mixer beat the butter and sugar in a large bowel until pale and creamy. Add the eggs, one at a time, beating until just combined. Add the sour cream and 1/3 cup of Barker’s of Geraldine Orange, Barley and Passionfruit Syrup, reserving the remaining syrup for cup for later use. 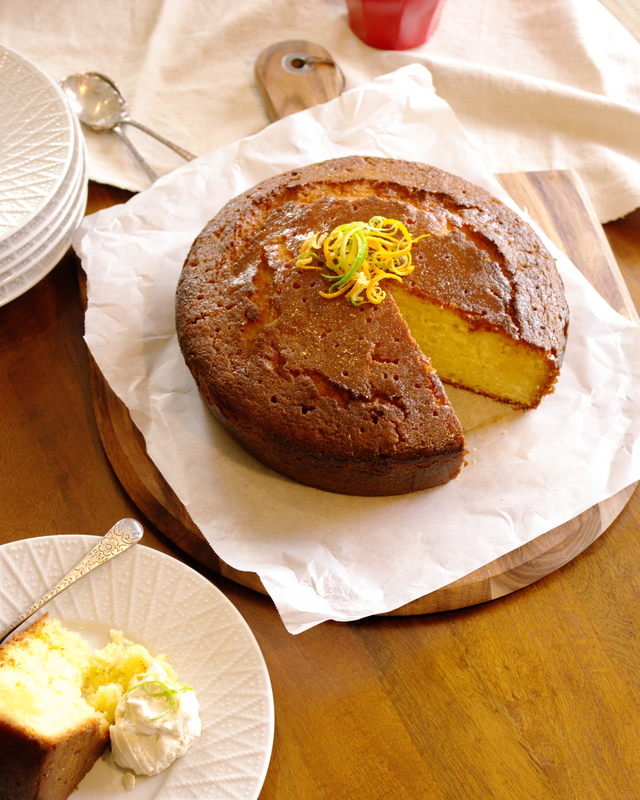 Remove the cake from oven and while hot use a bamboo skewer to prick the top of cake all over, pour over the remaining 1/3 cup of Barker’s of Geraldine Orange, Barley and Passionfruit Syrup allowing the cake to absorb the syrup as you go. Set aside for 15 minutes to cook slightly, remove from tin, cut into slices and serve warm with cardamom cream.